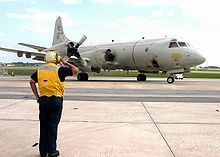 The Lockheed P-3 Orion is a four-engine turboprop anti-submarine and maritime surveillance aircraft developed for the United States Navy and introduced in the 1960s. 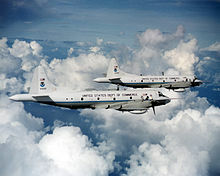 Lockheed based it on the L-188 Electra commercial airliner. The aircraft is easily distinguished from the Electra by its distinctive tail stinger or "MAD Boom", used for the magnetic detection of submarines. Over the years, the aircraft has seen numerous design developments, most notably in its electronics packages. 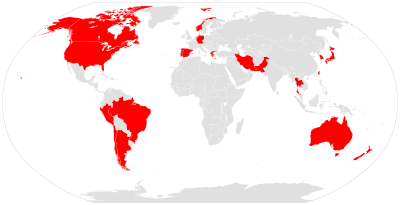 Numerous navies and air forces around the world continue to use the P-3 Orion, primarily for maritime patrol, reconnaissance, anti-surface warfare and anti-submarine warfare. A total of 757 P-3s have been built, and in 2012, it joined the handful of military aircraft including the Boeing B-52 Stratofortress, Boeing KC-135 Stratotanker, Lockheed C-130 Hercules and the Lockheed U-2 that have seen over 50 years of continuous use by the United States military. The Boeing P-8 Poseidon will eventually replace the U.S. Navy's remaining P-3C aircraft. The prototype YP3V-1/YP-3A, Bureau Number (BuNo) 148276 was modified from the third Electra airframe c/n 1003. The first flight of the aircraft's aerodynamic prototype, originally designated YP3V-1, was on 19 August 1958. While based on the same design philosophy as the Lockheed L-188 Electra, the aircraft was structurally different. The aircraft had 7 feet (2.1 m) less fuselage forward of the wings with an opening bomb bay, and a more pointed nose radome, distinctive tail "stinger" for detection of submarines by magnetic anomaly detector, wing hardpoints, and other internal, external, and airframe production technique enhancements. The Orion has four Allison T56 turboprops which give it a top speed of 411 knots (761 km/h; 473 mph) comparable to the fastest propeller fighters, or even slow high-bypass turbofan jets such as the Fairchild Republic A-10 Thunderbolt II or the Lockheed S-3 Viking. Similar patrol aircraft include the Soviet Ilyushin Il-38, the French Breguet Atlantique and the British jet-powered Hawker Siddeley Nimrod based on the de Havilland Comet. The crew complement varies depending on the role being flown, the variant being operated, and the country that is operating the type. 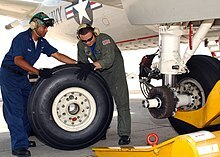 In U.S. Navy service, the normal crew complement was 12 until it was reduced to its current complement of 11 in the early 2000s when the in-flight ordnanceman (ORD) position was eliminated as a cost-savings measure and the ORD duties assumed by the in-flight technician (IFT). 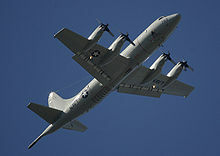 Data for U.S. Navy P-3C only. 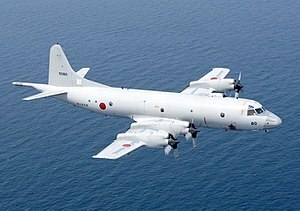 Since 2009 the Japan Maritime Self-Defense Force has deployed P-3s to Djibouti for anti-piracy patrols,    from 2011 from its own base. As well the German Navy is contributing assets against piracy with one P-3 from time to time. In 2002, the RAAF received significantly upgraded AP-3C. Also known as Australian Orions they are fitted with a variety of sensors. They include digital multi-mode radar, electronic support measures, electro-optics detectors (infrared and visual), magnetic anomaly detectors, identification friend or foe systems, and acoustic detectors. The Boeing P-8 Poseidon is gradually replacing them. The P-3 Orion celebrated 50 years of RAAF service in November 2018. 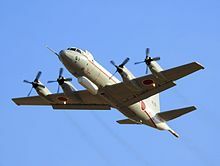 Japan Maritime Self-Defense Force – 93 P-3C, five EP-3, five OP-3C, one UP-3C, three UP-3D. The Kawasaki Corporation assembled five airframes produced by Lockheed, and then Kawasaki produced more than 100 P-3s under license in Japan. The Kawasaki P-1 is gradually replacing them. Royal New Zealand Air Force – six P-3K2 ( 5 Sqn); based in RNZAF Base Auckland. Operated by 5 SQN. 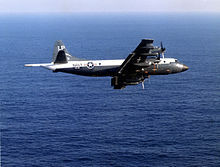 Five were originally delivered in 1966 as P-3Bs. Another was purchased from the RAAF in 1985. 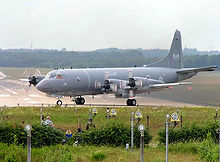 All six have been upgraded by L-3 Communications Canada and now designated as P-3K2 , with the first upgraded aircraft delivered back to New Zealand in April 2011 . The New Zealand Government announced  they are to be replaced in 2023 with the purchase of 4 Boeing P-8A Poseidons. 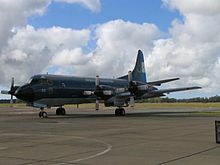 An interim upgrade contract worth NZ$36M has been awarded to Boeing to upgrade the underwater intelligence, reconnaissance and surveillance capability of the P-3K2 , with a capability similar to what is provided in the P-8 . Pakistan Naval Air Arm – ~Four P-3C; based in Naval aviation base Faisal, Karachi. 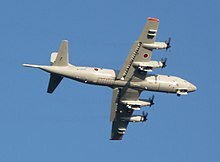 Upgraded P-3C MPA and P-3B AEW models (equipped with Hawkeye 2000 AEW system) ordered in 2006,  first upgraded P-3C delivered in early 2007. In June 2010, two more upgraded P-3Cs joined the Pakistan Navy with anti-ship and submarine warfare capabilities. A total of nine (9). Two aircraft were destroyed in an attack by armed militants at the Mehran Naval Airbase. ^ Murphy, Pat. 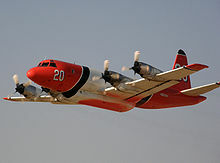 "Fighting fire like a regular military ground, air war: Onetime jinxed airliner now a superstar fire bomber. "[ permanent dead link] mtexpress.com, 2010. Retrieved: 16 November 2010. ^ Chudy, Jason. "P-3C Anti-Surface Warfare Improvement Program (P-3C AIP)." military.com. Retrieved: 14 July 2010. ^ Ansari, Usman. "Pakistan Navy To Boost Air Surveillance Capability. "[ permanent dead link] defencenews.com, 30 January 2010. Retrieved: 14 July 2010.